Brace yourself: South Monroe Street is about to get a whole new look and vibe. The area that has been tagged “SoMo” is slated for an infusion of commercial and residential investment that investors and local officials believe will create jobs and spur additional development in an area of Tallahassee that has long been overlooked. But unlike the “urban renewal” projects of the 1960s and ’70s, which decimated poor minority neighborhoods around the country and led to gentrification and displacement of residents, the vision for the South Monroe/Adams Street Corridor has a focus on its people. “Historically, we all know we have not invested in the south side as we have in other parts of town,” County Commissioner Kristin Dozier said. Good things are already happening: It started with the opening of Cascades Park, creating a downtown destination, and the Capital Cascades Crossing Pedestrian Bridge, which provides safe access from the park to South Monroe and the Capital Cascades Trail. The extension of FAMU Way improved both aesthetics and safety. Proof Brewing Company relocated to the old Coca-Cola bottling plant. The old Graphateria Building has been redeveloped for Catalina Café and Red Eye Coffee Roastery. A juicing operation, South City Juice, is also moving in. 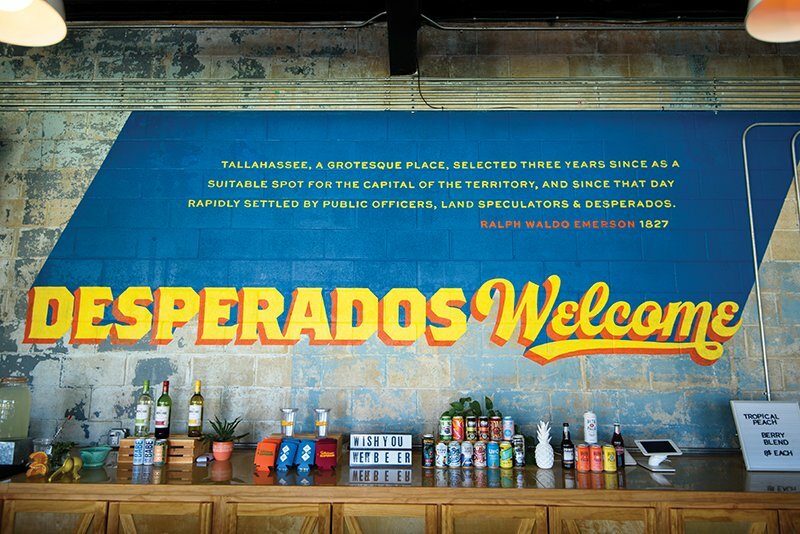 Happy Motoring Co., a bar and food truck hub located in an old gas station, converted one of its regular food trucks to a food operation inside the building in October. “SoMo is in transition, and it’s more of a revitalization as opposed to a redevelopment,” said Happy Motoring co-founder Jake Kiker, an attorney who lives in nearby Myers Park. Kiker is working with Demirel International on a proposed retail and residential project known as Cascade Gardens that would stretch along the east side of Monroe from Oakland Avenue to Pershing Street. The project would have commercial space on the ground floor, apartments above, attached townhomes and detached single-family houses behind. Bugra Demirel is engaged to be married and plans to live in Cascades Garden, Kiker said, and he’s trying to get an Aldi grocery store to locate there. “Bugra wants to make it neighborhood-friendly, with nice sidewalks, buried utility lines, sustainable and pedestrian-friendly,” Kiker said. Sprucing up the south side of town and boosting its economic engine have been discussed for years, and the area’s needs and deficits have been well-documented. The study area stretched from FAMU Way south to Orange Avenue and Jim Lee Road west to Adams Street, incorporating much of South Monroe Street. The report also noted the area’s residents are 83.5 percent African-American, 60 percent female, 40 percent children and teens under 18 and 21.4 percent children under the age of 5; 76.4 percent live in female-headed households with income below the poverty line, 57.8 receive food assistance and 22 percent have no public or private health insurance. How do you begin to tackle such an enormous problem? You start with the basics. “If you build it, they will come” first entered the lexicon in the baseball movie “Field of Dreams,” but it’s applicable to urban revitalization, as well. Tallahassee-Leon County’s Blueprint initiative, a 1 percent sales tax that voters first approved in 1989 and renewed and expanded in 2000 and again in 2014, pays for infrastructure improvements to enhance safety and quality of life. Roads, sidewalks, storm-water mitigation and lighting are examples of infrastructure projects. Those improvements also attract private investment. Infrastructure improvements along the Gaines Street corridor saw a three-to-one return on investment in private dollars, Blueprint’s Public Information Officer Susan Emmanuel said. The Blueprint 2020 plan, approved in 2014, authorizes the tax through 2040. It also sets aside 12 percent of revenues for economic development and created the Office of Economic Vitality. The South Monroe/Adams Street Corridor figures prominently in both Blueprint’s infrastructure projects and the OEV’s strategic plan for economic development. Blueprint’s Monroe-Adams Corridor Placemaking project will make South Monroe more pedestrian-friendly from FAMU Way/Oakland Avenue to Magnolia Drive by installing medians. Other planned streetscape improvements include sidewalks, lighting, signage and underground utilities. Street parking will be created where possible along side streets. The OEV is evaluating a South Monroe/Adams Corridor Catalysts proposal that uses a mix of public and private funding and involves Florida A&M University’s Small Business Development Center and its Urban Agriculture Project. City Commissioner Curtis Richardson, current chair of the Blueprint Intergovernmental Agency, said environmental contamination along South Monroe has hampered revitalization efforts in the past. The city and county have other plans to boost the south side, including a new public safety complex off South Monroe, the redevelopment of Orange Avenue Apartments and creating a Star Metro “superstop” at the corner of Orange Avenue and South Meridian Street.